OMAHA, NE – Sitting in his cubicle, Desktop Information Technology employee Garret Cutler dreams of, and is preparing for, the day when he will be called upon to save the world with his batch file writing skills. Batch files are text based files used by computers to execute commands. 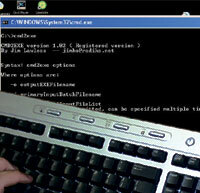 The batch file is a relatively simple form of programming and widely used by IT workers world wide. Of the 23 Desktop IT staffers, employed at Myers, Inc, all but one can write batch files. According to Professor Wayne Collins, Omaha County Community College, batch files are relatively easy to create and are among the first things any student learns when taking a computer information systems course at a community college. Cutler has been dreaming of saving the world since he saw the film “Independence Day” in which computer programmers write a program that defeats an alien invasion. According to IT historians, there has not been a single instance of a batch file saving the world.